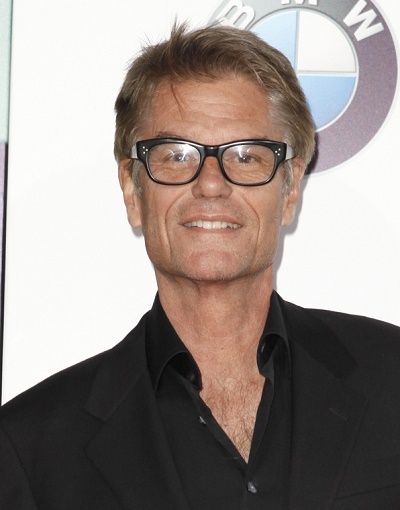 Harry Hamlin is an American actor. He is the son of Berniece/Bernice (Robinson), a socialite, and Chauncey Jerome Hamlin, Jr., an aeronautical engineer. Harry is married to actress Lisa Rinna, with whom he has two daughters. He has a son with his former partner, actress and model Ursula Andress. Harry was selected People Magazine’s “Sexiest Man Alive” in 1987. Harry’s patrilineal line can be traced back to James Hamlin, who was born, c. 1636, in Reading, Berkshire, England. Harry’s paternal grandfather was Chauncey Jerome Hamlin (the son of Harry Hamlin and Grace Enos). Chauncey was born in New York. Harry’s great-grandfather Harry was the son of Cicero Jabez Hamlin and Susan Jane Ford. Grace was the daughter of Laurens Enos and Mary King. Harry’s paternal grandmother was Emily Ann Gray (the daughter of David Gray and Martha Guthrie). Emily was born in New York. David was born in Midlothian, Scotland, the son of Philip Cadell Gray and Amelia Tasker. Martha was the daughter of Sheldon Guthrie and Emily Ann Terry. Harry’s maternal grandfather was named Clarence Asher/Arber Robinson. Clarence was born in Michigan. Harry’s maternal grandmother was named Anna F. West. Anna was born in Nebraska.